As a parent, you know how quickly kids outgrow their clothing, shoes, toys, and even sometimes furniture. And you also know just how expensive it can be to constantly replace these items. Selling at a kids consignment sale can be a great way to get rid of outgrown or unused items that are in good condition or to stock up on the things your children need without breaking the bank. A few good kids consignment sales tips will give you the tools you need to tackle this great way to buy and sell children’s clothing. Large scale kids consignment sales can be a little bit overwhelming for both buyers and sellers, if you don’t know what to expect. There are dozens of sellers with thousands of items, all in one place. When you go into a consignment sale, being prepared is crucial to getting the most for your money or getting the most out of your items. 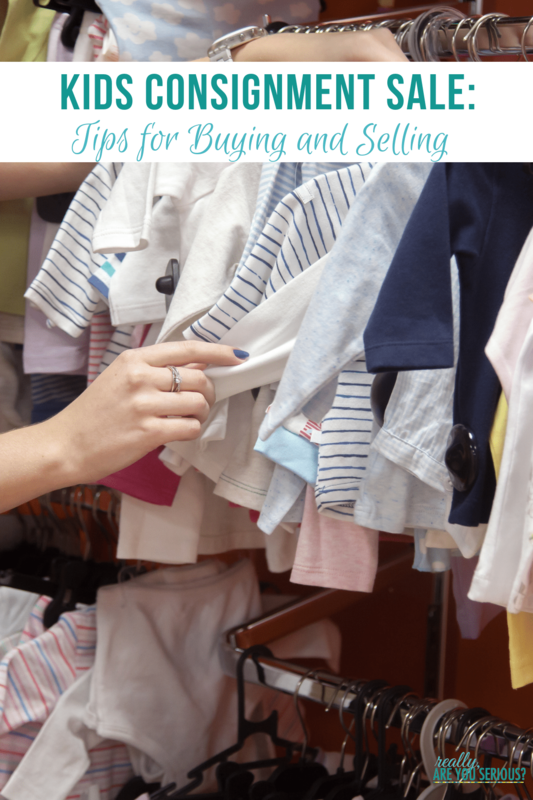 Here are some great tips that can help you make the most of kids consignment sales. Before you head out to the consignment sale, find out what type of payments are accepted. There is nothing more frustrating than standing in a long line to check out, only to find out that they accept cash only and all you have is a credit card with you. Get the details about accepted payments, admission fees, and any other important points ahead of time to avoid disappointment. The best items are going to fly out the door quickly, so getting there early is important. While there are sometimes additional discounts in the last hours of an event, all of the “good stuff” will be picked over and long gone. In some cases, kids consignment sales offer a presale period where select people can shop the sale before it is open to the public. Investigate the sale you plan to attend and see if there are any presale opportunities that you can take advantage of. Walking into a consignment sale to browse can be fun, but it is tough to accomplish anything without a plan. Know what you need, want, and want to skip over so that you can attack the right racks and areas with gusto, bypassing the items that would be money-wasting impulse buys. Take along your children’s sizes, measurements, and a tape measure to be sure that the items you are picking up will fit, as there are typically no returns. Again, you usually can’t take back items purchased at a consignment sale, so be sure to check carefully for damage, stains, or missing pieces. Look under tags and other areas that might be used to hide stains and damage, as well. Bring your own bags! In most cases, you won’t have the benefit of a shopping cart, so a large tote bag, clothes basket, or wagon (if allowed) can be a great help when making your way around the sale with your haul. Keep in mind that things can get heavy, so something that is comfortable to carry is important. Many consignment sales offer a significant discount on the last day of the sale. Items will be picked over, but often you can get 50% off (the seller usually has to agree to it). Keep this in mind if you are trying to save more money. The night before the sale is not the time to start organizing your consignment items. Instead, start weeks or even months ahead of time, cleaning out clothes, deciding which are in good enough shape for resale, and keeping them organized and ready for tagging when it gets close to time for the sale. Start saving store hangers and asking friends for hangers from dry cleaners and stores. Most places require that you have items on hangers so start saving them up now. Every kids consignment sale has its own rules and regulations, including instructions on how items are to be tagged. Make sure that you know and follow the rules, so that you deliver your items on time, have them properly tagged to get full credit, and that there are no other issues that could cost you a sale. It can be tempting to overprice items, especially when you have a sentimental attachment to them. But realistically, your buyers don’t want to pay double what an item is worth because little Suzy looked so adorable in it on her first Christmas. If you can’t remove your personal attachment from the item, you’re better off keeping it. Buyers are here for a bargain on gently used clothing, toys, and furnishings, so keep that in mind when setting your prices. Grabbing a trash bag of dusty, dirty toys from the garage and throwing them into a kids consignment sale is not going to make you any money. In fact, some sales may not even allow your items to be put out if they are too dirty. Clean things up, remove stains if you can, wash clothing, and put new (cheap) batteries in toys so that people can see that they work. You’ll make far more sales for clean and working items! Consignment sales are a great way to make a little bit of money off your children’s outgrown toys, clothes, and furniture! Are you a consignment sale buyer or seller? What are your best kids consignment sales tips? Hello, This is Stay-in-Bed Mom Blog. I just nominated you for The Sunshine Blogger Award! Congratulations! Congrats again!